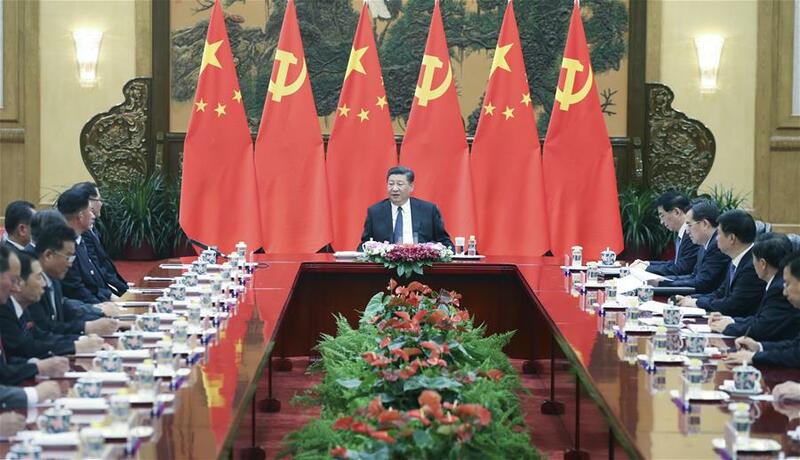 BEIJING, May 16 (Xinhua) -- Xi Jinping, general secretary of the Central Committee of the Communist Party of China (CPC) and Chinese president, on Wednesday met with a friendship visiting group of the Workers' Party of Korea (WPK) of the Democratic People's Republic of Korea (DPRK). The group was led by Pak Thae Song, member of the Political Bureau and vice-chairman of the WPK Central Committee, and composed of senior provincial and municipal level party officials. Pak extended sincere greetings to Xi from Kim Jong Un, chairman of the WPK and chairman of the DPRK State Affairs Commission. Xi also conveyed his best wishes to Kim via Pak. "Chairman Kim paid a successful visit to China in March and we had a historic meeting. Last week, Chairman Kim and I met again in Dalian. We had an in-depth exchange of views on major issues of common concern, charting a clear course for the China-DPRK relations in the new era," Xi said. Xi said the current visit by senior provincial and municipal level party officials of the DPRK was not only the concrete implementation of the important consensus reached between him and Kim, but also an important exchange between the CPC and the WPK. "This embodies the great importance Chairman Kim and the WPK Central Committee have attached to enhancing exchanges between the two parties and the two countries, and deepening China-DPRK friendly cooperation," Xi said. He said that he believed both sides would take the occasion of the visit to further advance exchange and cooperation to forge ahead with the China-DPRK friendship. Xi said that socialism with Chinese characteristics had entered a new era, while the DPRK's socialist development had entered a new historical period. "China backs the improvement of inter-Korean ties, the advancement of dialogue between the DPRK and the United States, and denuclearization of the Korean Peninsula," Xi said. "China supports the DPRK in developing its economy and improving its people's livelihood, and supports Chairman Kim in leading the Party and the people of DPRK to take a development path suitable to its own national situation," Xi said. Xi pledged to strengthen exchanges of experiences in party and state governance in the hope of promoting better development of the two countries' socialist causes. Calling the visiting officials the "backbone of the DPRK's socialist cause," Xi expressed his wishes that they would score greater achievements in promoting the DPRK's economic and social development under the leadership of Chairman Kim. Pak said top leaders of the WPK and the CPC carried forward the fine tradition of friendship between the two countries, held historic meetings in succession in a comradely and cordial manner, and promoted bilateral ties to a new stage. He told Xi that this visiting group, dispatched by Chairman Kim, aimed at implementing the consensus reached by top leaders of the two parties, learning from China's experience in economic development and reform and opening up, playing an active role in implementing the DPRK's new strategic line of concentrating efforts on economic development, and making new contribution to the consolidation of DPRK-China friendship that had been personally enhanced by leaders of the two parties. Xi took a picture with the WPK visiting group before the meeting. Ding Xuexiang, member of the Political Bureau of the CPC Central Committee, member of the Secretariat of the CPC Central Committee and director of the General Office of the CPC Central Committee, also attended the meeting.